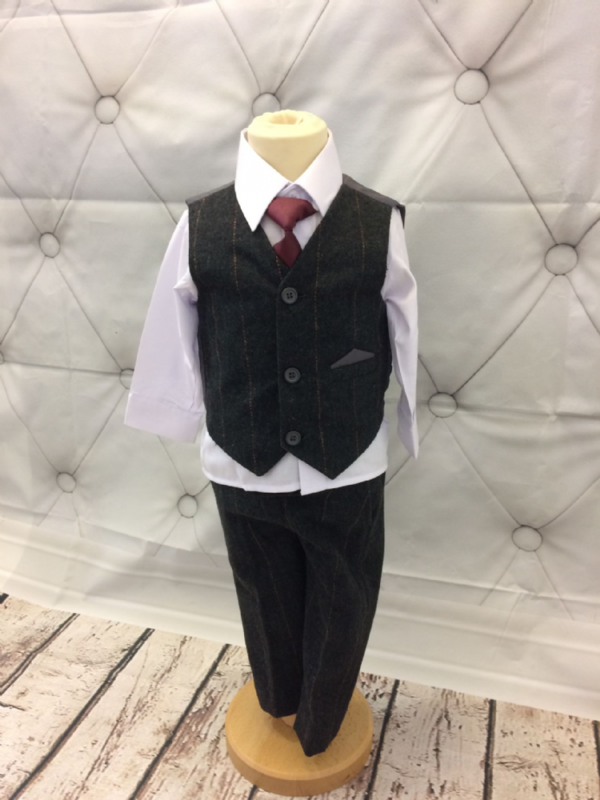 Boys Four piece suit, complete with trouser, shirt, waistcoat and a burgundy tie. The trousers are grey have an elasticated waist, with zip fly and button fastening. This suit is available in a range of sizes (see size guide below). Please note, if your size is out of stock you can still order and we will contact you to let you know how long delivery will be (up to 4 weeks). If you wish to pre-order, please select the pre order option (<18-24 months or 2 years +) and then provide details of the size you require in the comment box above. Please note: the sizes shown below are approximate. 2 years 18-22.5" 14.5" 27"
3 years 18-23" 16" 28"
4 years 18.5-24" 18" 29"
5 years 20-25" 19" 30"
6 years 21-25.5" 21" 31"
7 years 21.5-26" 23.5" 32"
8 years 22-27" 24.5" 33"